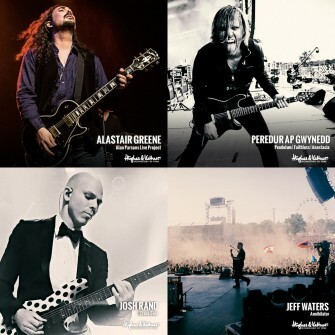 Did you know there’s already more than 50,000 guitarists rocking Meisters (that is, the GrandMeister and TubeMeister series) on stages all over the world? If you didn’t, maybe it’s time to find out what all the fuss is about. The year 2015 has been one to remember for the Meister Family – and it’s going to get even better. First came the release of the WMI-1, a wireless MIDI interface that lets you control all your GrandMeister’s settings from anywhere on the stage. It’s the perfect solution for the Meister who wants to tweak their tube tone right from their mic stand. We’ve also seen a bunch of Meisters on massive tours and festival stages all over the place. Jeff Waters and Annihilator rocked a 70,000-strong crowd at the legendary Wacken festival in July. Jeff’s GrandMeister filled the massive field with ease. Annihilator’s 15th studio album, Suicide Society, hits stores in September 2015, and the band will be hitting the road for a massive European tour to celebrate, GrandMeister in tow. Another of our Meisters, Peredur Ap Gwynedd, is playing a string of huge shows with the likes of Anastacia and Faithless this year. Perry never hits the stage without his trusty GrandMeister. Meanwhile, Alastair Greene is still handling guitar duties for prog rock and production legend Alan Parsons on tour. The group’s incredible stage production is again travelling the world this year, and the distinctive blue lights of Alastair’s TubeMeister 36s will be ever-present. On the recording front, Josh Rand of Stone Sour has also been busy with his TubeMeister this year, with the band releasing the hotly-anticipated Meanwhile In Burbank… covers EP in April. And that’s just the tip of the Meister Family iceberg: don’t forget there’s 50,000 others out there! Have you joined the Meister Family yet?